I'm sad to see our ocean theme month come to an end, we still had so many things on our list to explore and do, but they will have to wait for now as we close this months theme and start anew. This month marked a major milestone for us, we invited our doors open to friends and asked for our blogger friends to join us celebrate anything to do with the sea! Thank you so much to our collaborators, please do pop over to their blogs and have a look at their ideas, they are all firm favourites of ours and all have fabulous pre-school and toddler ideas! We started with some fabulous sea animal ice play from Aparna at the The Weaving ideas. Then were joined by Clare's little tots who's activities ranged from fishy crafts to beach sensory play to a play dough invitation to play. 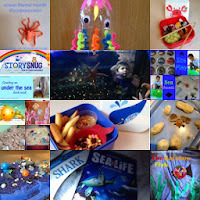 We had some super story ideas from Cuddles & muddles & muddy puddles gave us a great idea for an under the sea book nook. 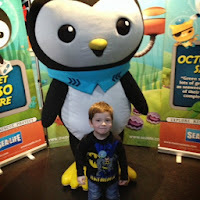 And Storysnug shared a review of some sea themed books. Our final guests were the Wilkinsons over at 3princessesand1dude who made some very cute cd rainbow fish. They have also made some fantastic toilet roll fish puppets puppets too - 2 great recycling projects, right up my street! T and I created an octopus from a recycled bottle which was our post of the month and have had an ocean small world sensory tray on the go all month. We made excavation rocks to go with our tray and smashed them open to reveal turtles and crocodiles! We also had a couple of fishy snacks too! The highlight of our month was our trip to the Great Yarmouth Sealife Centre where T met one of his Octonaut hero's Peso. We also managed a lot of reading this month of sea life and fishy books.